Earn 30,000 miles after you spend $1,000 on purchases within the first 3 months. Terms Apply. 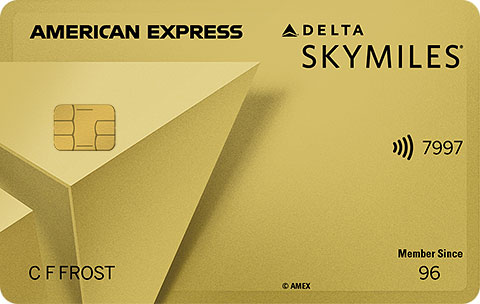 The Gold Delta SkyMiles® Credit Card from American Express® (a SmartAsset advertiser) caters to frequent travelers, in particular those who are regular customers of Delta Airlines or their partners. By applying for the card, you gain access to a number of opportunities to earn miles towards free Delta flights. For every dollar spent using the card (fees or purchases of cash equivalents like traveler’s checks are not included) Delta will credit your account 1 mile, and for every dollar spent on purchases made directly through Delta they will credit 2 miles. Moreover, by spending $1,000 with the Gold Delta SkyMiles® Credit Card within the first 3 months of opening an account, you will earn 30,000 SkyMiles®. In addition to helping you accrue miles, the Gold Delta SkyMiles® Credit Card from American Express provides a number of travel amenities. For Delta flights booked using your card, you will have the option to check one bag free and board your flight early. Furthermore, international traveling won’t cost you extra as the Gold Delta SkyMiles® Credit Card has no international transaction fees. With no annual fee for the first year of use, the American Express Gold Delta SkyMiles® Credit Card may be the right choice of credit card for those fans of Delta Airlines looking to save on traveling. Earn 2 miles on every eligible dollar spent on purchases made directly with Delta. Earn one mile for every eligible dollar spent on other purchases. APR for Cash Advances: 27.49% Variable% Variable. Balance Transfer Fee: $5 or 3%, whichever is greater. Cash Advance Fee: $5 or 3%, whichever is greater. Returned Payment: Up to $38.